I bet you’ve always wanted to do a handstand. If you’re trying to learn more advanced moves like handstands, it’s important you have a solid plan to follow! If you’re looking for expert guidance, form checks (to make sure you’re doing it right! ), and accountability, check out our uber-popular 1-on-1 Online Coaching Program! Here’s how it works: your Nerd Fitness Coach will get to know you, and then build you a custom program that they’ll adjust regularly based on your progress. Through our app, they’ll check your exercise form to make sure you’re doing all movements correctly. Oh, and they’ll provide you with expert guidance and accountability throughout the whole process! 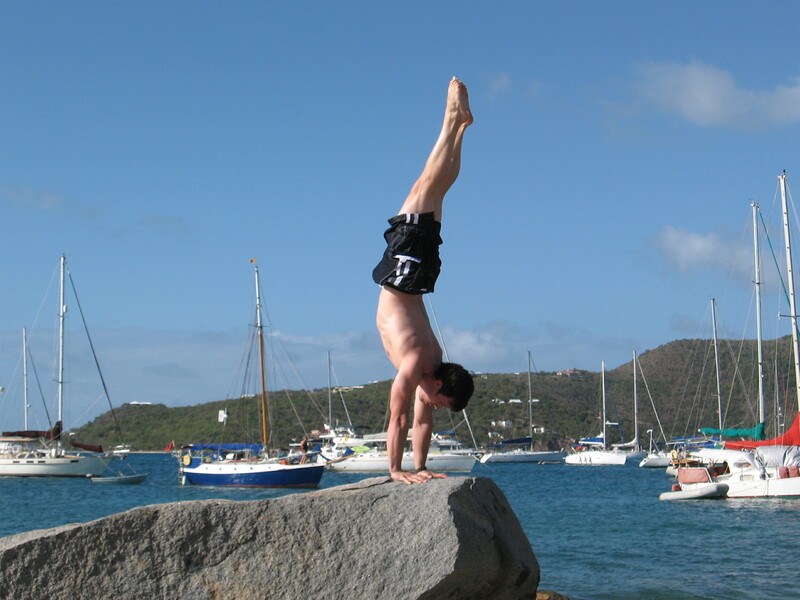 Team Nerd Fitness member Jim Bathurst has been training and working on handstands for years. 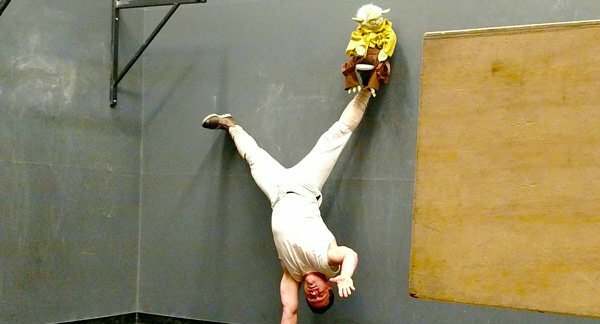 From humble beginnings, he taught himself a standard handstand and eventually worked his way up to one-handed tricks like the photo above. It scares you – yes, that’s a positive. We grow outside our comfort zone and for many people, just the thought of a handstand is enough to make their palms sweaty, knees weak, arms are heavy. Vomi… nevermind. The point is that the handstand is just as much of a mental challenge as it is a physical one. How scared do you think this guy gets on a regular basis? Sure, we need to build strength to support ourselves upside-down, but even that hurdle is overblown. A proper handstand actually starts to feel easy. That’s because once you’re balanced and aligned, it becomes uber efficient. Just as you don’t exert yourself much if you stand straight with good posture, a good efficient handstand is the same way… it will soon start to feel effortless. 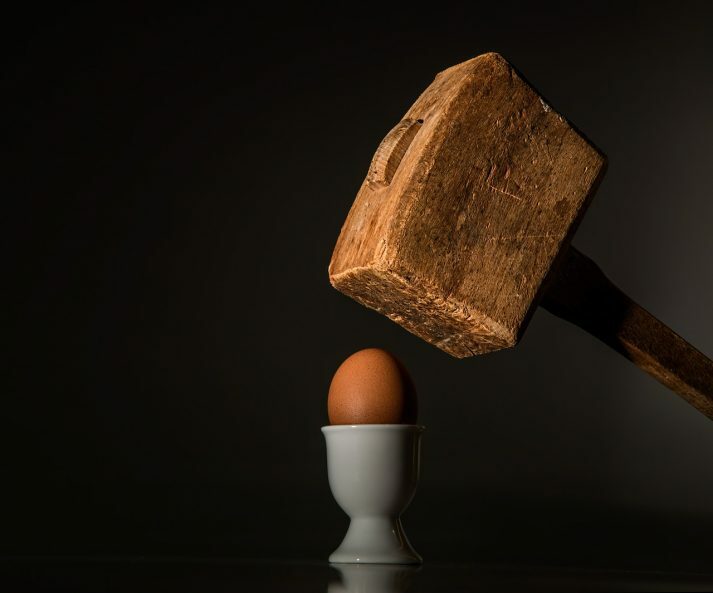 Actually, the biggest hurdle to overcome – especially at the beginning – is the mental fear. The voice/feeling in the back of your head that says “you could get hurt doing this!” SCARY! And I won’t sugar-coat things, you can hurt yourself working these skills… but it’s no different than if you walked into the gym first day, slapped 315 lbs on the bench press and gave it a go. Or went out and tried to run 13 miles without training. The exercise itself isn’t dangerous. Only if you approach it too fast. If you wouldn’t load up a bar to 500 lbs your first day, why do so many people just kick and fling themselves up into a handstand, failing repeatedly, hoping one day they’ll “get” it? There’s a smarter way! How do we overcome this fear and keep ourselves safe? Just like learning any other fitness skill: slow, easy, successful steps! These small victories accumulate over time to bring us to our goals safely while having a lot of fun. Don’t worry, we’ve got you covered. 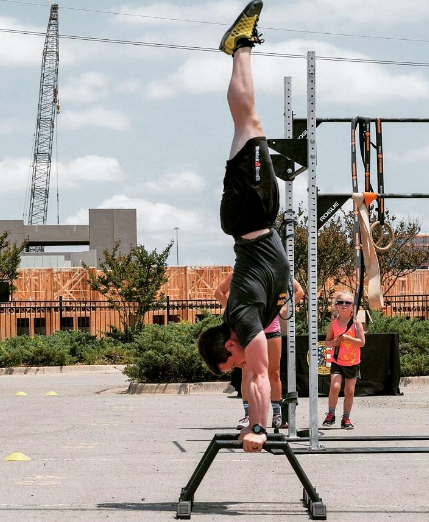 Read on for ways to safely progress to handstand mastery! 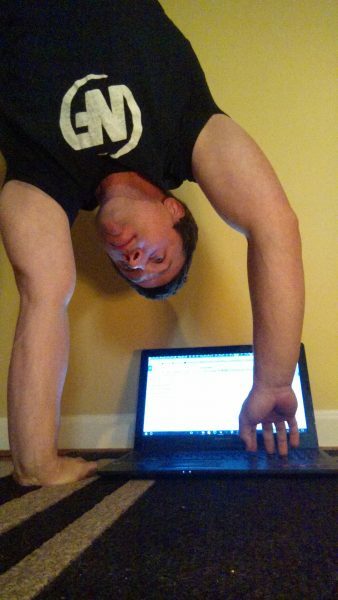 For any handstand exercise, there is going to be a significant amount of stress on the hands and wrists… you’re not Cap! So, it’s important you stretch and warm things up. Here is a video from our NF Handstands course going over some of our favorite wrist stretches to prepare to get upside-down. Go through each stretch about 10 times. The shoulders are another stressed area in the handstand. There are several ways we can prepare them for work, but a few rounds of jumping jacks or even just arm circles will get the blood moving and the area ready. For the first two weeks of your handstand journey, we’ll have you work with some balance drills and some positional drills. Nothing too crazy, and in fact some of these might seem TOO EASY. That’s fine! That’s what we want, remember? We’re using small victories to motivate us. Dropping you on your head in the quest for a handstand is not a way to motivate anyone. 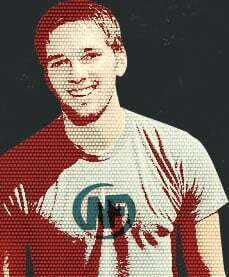 Well, maybe this guy. In this drill, we’ll get started right away working toward something that actually looks like a handstand! If you’re like me, you’ll probably get excited and start to overreach a bit at this point. But I believe in you: don’t let the enthusiasm and suspense get the best of you! All we’re trying to do with this exercise is support our bodyweight on our straightened arms (just like the front plank or pushup). So, the first level of this exercise is to simply get yourself up into the top of a pushup and hold. If that’s too hard,put your hands up on an elevated surface and/or rest on your knees and hands instead. Once this is mastered, level up by simply lifting your hips in the air into a down dog position! From here, it’ll be a matter of getting your feet onto a higher and higher surface. Note: putting your feet up something (I like bumper plates) even a few inches off the floor counts – small steps! As you progress, add more bumper plates (or whatever you’re using) so your feet are higher and higher. Be careful at this step: Be sure you have enough energy to walk back down safely and second, and that you don’t walk too close to the wall and risk flipping onto your back! With each of these variations, we’re looking to build up to a solid 15 seconds under control before moving forward. The hollow body is one of the best ways to to engage the midsection and stabilize the body. It will help to give your handstand a good shape. 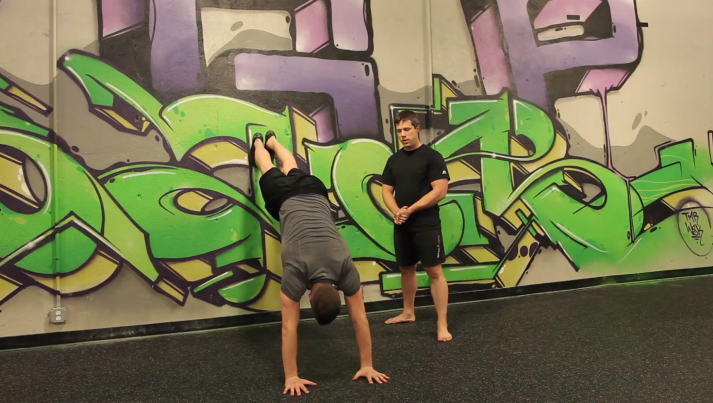 Do you need to master the hollow body to master the handstand? Not necessarily, as there are plenty of handstands out there that are a bit banana-shaped. But the hollow body will help you create a more efficient position. Start by laying down a yoga or exercise mat on the ground and laying on the ground face up. Think about pressing your lower back down into the ground and engaging your midsection like you’re coughing. You should still be able to breath! Once the midsection is set, tuck your knees to your chest and hold your shins like you’re getting ready for a wicked cannonball. Holding the shins will help you maintain that lower back and midsection position. Still feeling good? Then try rocking! Rock your body forward and back slightly from the upper back to the lower back, like a rocking chair. Head and feet stay off the ground. If you are stable then you should move as one unit. If you need more of a challenge, reach your arms by your ears, keep the knees tucked, and rock some more. Without the hands holding the shins, the midsection really has to keep engaged in order to give you a smooth rock. Again, with any of these positions, build up to be able to rock for a full 15 seconds under control. 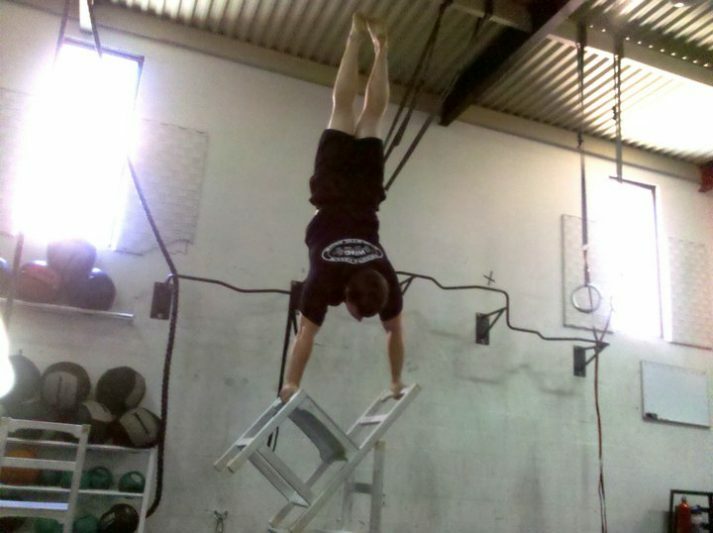 You may be thinking that feeling the balance of a handstand is going to be brutally difficult. Not so! We can start quite easily on our hands and knees in the quadruped position. From here, we will simply rock forwards and backwards on our hands. Seem familiar? If you did the wrist mobility we described above, it’s the same motion! Isn’t that handy? As you are rocking back and forth, feel where the weight rests in your hands. When you rock back, it sits more in the heel of your hands. When you rock forward, you’ll feel it in your knuckles and fingertips. Where do we want it in the handstand? Right around the knuckles. This is a balanced spot – similar to the balance you find when standing. You don’t sit all your weight on your heels, and you don’t lean all your weight forward, gripping your toes hard into the ground, do you? Find and feel that balance when you rock. Ready for the next step? Try Crow Pose. To enter Crow Pose, move forward from the Quadruped Rock position so that your knees are on the outside of your arms. You can even bend the elbows a little and rest your legs on them. Rock forward in the same manner as before, putting a little more weight on the hands and a little less weight on the feet. Important: this isn’t Assassin’s Creed… We are not making a leap of faith here! Don’t jump!! We are simply looking for less and less weight on the feet. Take things slow and easy – rising up on the toes when you can. When you are ready to pick the feet up and hold yourself off the ground on just your hands, it should come naturally. Be sure to grab into the ground hard to hold and control yourself, and feel free to put down a pile of pillows or mats in front of you if you should fall! All these rocking and balance drills can be done for several sets of 5-10 reps. Listen to your wrists and give things a rest as needed. Wall Walks, Learn to Bail Safely! This is one of the most important skills you can learn as you develop your handstand practice, as it will allow you to safely exit any handstand without any risk of injury as you develop your balance! Nothing beats patience and hard work, but there are a few tips and tricks we can provide that will allow you the best chance for success. Make sure you go through a proper warm-up: We’ve given you several options for the wrists and shoulders. Not only will a warm-up help prevent injury, but it will get the muscles and joints properly prepared to get the most out of your training. Prioritize Your Handstand: You can work the skill on its own time, and it won’t interfere or be interfered by anything else, but what if you’re doing other exercises during your workout? When do you handstand? The best time to work the balancing drills is at the beginning of your workout, after you’ve warmed up. These skills require concentration and a fresh focus to really benefit and progress with them. Trying to balance after you’ve exhausted yourself with a tough cardio session is an exercise in futility (pun intended). The best time to work the positional drills would be sometime during your strength session, and before your cardio. 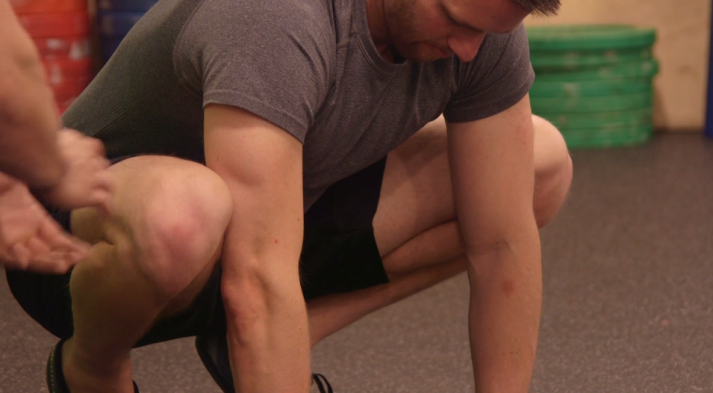 These drills are not as dependent on completely fresh muscles, but we still don’t want to try and hold ourselves upside-down after a grueling workout. We’ve mentioned this a million times because it’s so important. Taking on too much too soon is a way to develop bad habits and possibly injure yourself. Take your time! Enjoy and really master each step! Take it Easy: In the same vein, we want to look for success. What do I usually see when people practice handstands: Someone kicking up 100 times and kinda getting a handstand once or twice. How much sense does that make? While we might not be batting 1,000 with all our attempts, but we should be looking to successfully complete around 8 out of 10 attempts. If we’re not? Then we might have taken on too much, too soon! Commit to 5 minutes a day. That’s it. But do it every day. If you want more instruction, a skill-tree leveling system, and exact directions on what to do, for how long, and when to advance, check out our course, NF Handstands. I’ll see a lot of people go all in for a single handstand session, and then not touch the skill for a week or more. Dan Gable once said, “If it’s important, do it every day.” Now this is a simplification, but with handstands, this is ESPECIALLY important. When you first start out, your arms and shoulder may only be able to do 5 minutes before they are DONE. Doing them for a short time each day is the best strategy to improve strength, endurance, and balance. Have you ever tried to kick up into a handstand? PS: If you are somebody that wants to follow a program that is tailor-made for their life and situation and goals, check out our popular 1-on-1 Coaching program. You’ll work with our certified NF instructors who will get to know you better than you know yourself, check your form, and help you get the results you want!